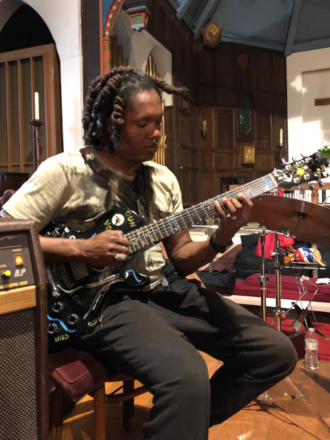 Born in Copenhagen, Denmark, Markus Schwartz grew up in an American household surrounded by jazz and has devoted more than 25 years to learning the wealth and complexity of traditional Haitian religious music. Moving in and out of Haiti since the early 1990's, Markus followed the lead of Haitian percussionists on pilgrimages into the countryside to learn the intricate and powerful drumming styles of the various lakou (historic religious compounds), such as Badjo, Soukri and Souvenance. Settling in Brooklyn in the late 1990's, Markus became a sought-after drummer at Haitian religious ceremonies, and was instrumental in creating the ground-breaking Haitian jazz quintet Mozayik, bringing his informed arrangements of Vodou rhythms to jazz standards, Haitian traditional songs, and Mozayik’s original compositions. 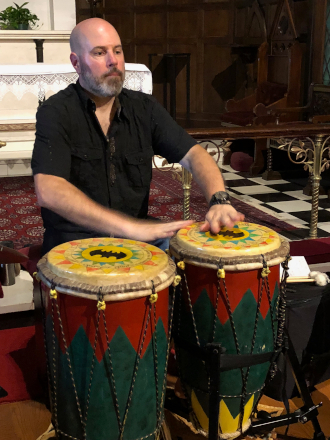 He has since become a first-call percussionist on the NYC Haitian music scene, performing and recording with a diverse array of artists across many genres. With an extensive discography as a featured artist on myriad projects, Markus has also released four seminal recordings as a leader thus far: Tanbou nan Lakou Brooklyn (2008), Equinox (2011) Vo-Duo Nou La with Monvelyno Alexis (2013), and Kay Sa (2019). Current projects include his own ongoing band, Lakou Brooklyn, as well as membership in Grammy-winning saxophonist David Sanchez' Carib project, Godwin Louis' Global project, Bohio Music with Monvelyno Alexis & Riva Nyri Precil, and We All Break, led by the iconic drummer Ches Smith, along with pianist Matt Mitchell and Haitian master drummer Daniel Brevil. Markus maintains an active freelance schedule as well, appearing locally and abroad with a host of talented artists from the Haitian community and beyond. 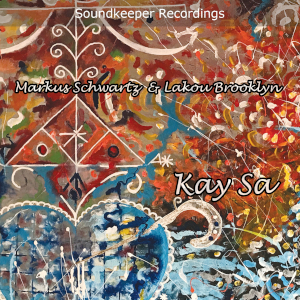 Read the Soundkeeper Recordings interview with Markus Schwartz here. A native of Haiti, Monvelyno Alexis is a multitalented instrumentalist, vocalist, and painter. When he picked up the guitar at the age of 18 his intent was the creation of a universal cultural language. The result is an approach to the instrument that is unequaled. Monvelyno learned from the creators of the Haitian roots music and matured into a skilled musician who has engaged in ethnological research at sacred places such as Soukri, Badjo, and Souvnans. The innovators of this movement guided the young musician, helping him understand the language of the drum and its relation to the guitar. He moved to the U.S. to study music. In his quest for an original sound, he merged all of his influences. Now he offers listeners a New Music Movement for the Haitian tradition. He names this new sound the Kod ak Po Project, and uses it to strengthen the Haitian culture. Monvelyno has accompanied various great artists of all styles from many countries. He has produced several albums with his new eighth note Kod ak Po sound, among them Kouzen Azakamede, Conscience State of Mind, Nou La, Perle de Culture, and Ayibobo. Godwin Louis, alto and soprano saxophonist, was born in Harlem, New York and began playing saxophone at age nine. He grew up in Bridgeport, Connecticut and Port au Prince, Haiti. Godwin was a finalist in the Thelonious Monk Institute of Jazz Saxophone competition and has performed around the globe to audiences in Mali, Senegal, Togo, France, Spain, United Kingdom, Italy, Russia, Azerbaijan, United Arab Emirates, Qatar, Venezuela, Colombia, South Korea, Thailand, Indonesia, and Australia. Godwin is a graduate of Berklee College of Music and the prestigious Thelonious Monk Institute for Jazz Performance. He has studied and performed with Herbie Hancock, Clark Terry, Roger Dickerson, Ron Carter, Al Foster, Jack Dejohnette, Jimmy Heath, Billy Preston, Patti Labelle, Toni Braxton, Babyface, Madonna, Gloria Estefan, Barry Harris, Howard Shore, David Baker, Mulatu Astakte, Mahmoud Ahmed, Wynton Marsalis, and Terence Blanchard just to name a few. In addition, he has performed as a sideman and guest soloist, and has conducted clinics and master classes worldwide. As a composer, Godwin has received the Jerome Foundation Emerging Artist Grant, and the Jazz Gallery's "New Works Commission". As an educator, humanitarian, and ambassador, he has traveled from Ghana to China to help promote cross-cultural understanding and introduce thousands to America’s indigenous art form through public concerts, master classes, and jam sessions. He is the founder of Experience Ayiti, a nonprofit educational, multidisciplinary arts organization. Godwin's debut recording as a leader, entitled Global, is set for release in 2019. Bobby Raymond, a native of Haiti who moved to Brooklyn at a young age, is a bassist, composer, producer, percussionist, and educator. 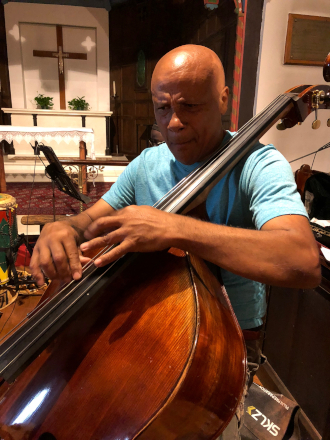 Drawn to the bass as a teenager, Bobby has created opportunities to explore various forms of music, including American jazz, Latin jazz, Bomba jazz, Afro Cuban jazz, and Haitian jazz. During the 1980’s Bobby was part of a niche of progressive musicians including Ernst Crepsac Marcelin, Buyu Ambroise, Eddy Bourjolly, Joe Charles, Phillipe Charles, Bobby Sanabria, Mino Cinelu, and Eddy Rodriguez. They regularly met in Brooklyn to experiment with a new kind of music, bridging and synthesizing modern American jazz with traditional Haitian music. That collective of musicians, through laborious workshops, sowed the seminal seeds to an emerging sub-genre of music tagged Haitian jazz. Their concerted effort gave rise to established bands such as Freefall, Mozayik, and the Blues In Red Band. Always looking for new musical horizons, Bobby’s interest in Haitian music grew exponentially when he joined the band Mystik under the direction of Dernst Emile, who experimented with horn and string arrangements in his quest to create a new sound in Haitian music. Bobby later joined Zin, a NY based Konpa Band. Zin, which was dubbed "Nouvelle Generation" or New Generation, infused modern technology into their music. Throughout his tenure with Zin, Bobby had the opportunity to arrange and compose some original songs for the band. He went on to produce and write music for singers such as Emeline Michel, Beethova Obas, and Alan Cave among others. During the 1990’s Bobby was part of the Blue Bomba Quartet, teaming with notable artists such as Robert Aaron, Willie Martinez, and Ismael Bongo Bruno. They were privileged to be joined by legendary Cuban percussionist Carlos "Patato" Valdés, who occasionally played with the combo. Other collaborations have included La Troupe Makandal (under the direction of Frisner Augustin), Kiskeya: The Haitian Orchestra (under the direction of Jean Jean-Pierre), and Astros Up 2 Date band (under the direction of Yves Arsene Apollon) featuring Antoine Rossini Jean-Baptiste (Ti Manno). Bobby has worked with legendary Haitian producer Fred Paul, owner of Mini Records and Productions, on various projects featuring a wide variety of Haitian artists. He remains a highly sought-after bass player with an active freelance calendar in the New York City Haitian music scene. He continues to perform and record with various artists on countless projects. 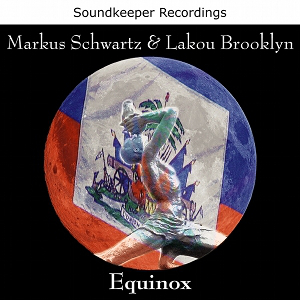 The previous iteration of Lakou Brooklyn, the band on Equinox, featured Jean Caze on trumpet and flugelhorn, and Paul Beaudry on contrabass. Winner of the 2006 International Trumpet Guild Jazz Competition and the 2004 National Trumpet Jazz Competition, Jean Caze has emerged as one of today's most exciting new voices in jazz. He has performed with Herbie Hancock, Najee, Arturo Sandoval, John Fadis, Randy Brecker and Bob Mintzer, to name a few. Paul Beaudry started his musical studies at age 5 on piano and age 8 on drums. He continued playing piano and drums until he took up electric bass at age 18 and acoustic bass two years later. A self-taught composer and producer he began writing and recording his own music at age 16, and wrote his first piece for orchestra at age 19. 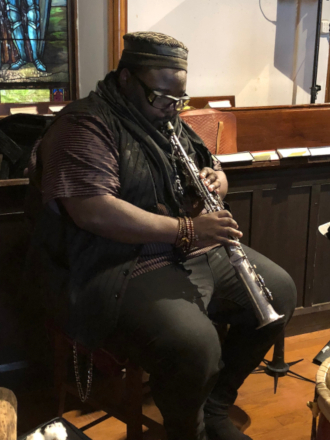 Paul has performed all over the world with Steve Turre, Wycliffe Gordon, Antonio Hart, Charlie Persip, Winard Harper, Dena DeRose, Allan Harris, Cynthia Scott, Eric Lewis and Miles Griffith. He has also performed in concerts or on recordings with such greats as Clark Terry, Jimmy Cobb, Frank Wess, Cecil Bridgewater, Eddie Henderson, Mike Longo, Roy Hargrove, Billy Harper, Dave Valentine, Don Braden, Wess Anderson, Billy Pierce, Gary Thomas, Cyrus Chestnut, Bruce Barth, Steve Slagle, Ron Blake, Joel Frahm and many others. Paul can also be heard on his Soundkeeper Recordings release Americas.